When it comes to outdoor furniture, it can be a tricky choice because you need chic design, functionality and durability – all of them at the same time! And of course your comfort and a feeling of coziness isn’t the last thing. Hanging and swinging furniture is on top of the list for a good rest after a long day but what about stylish looks and durability? 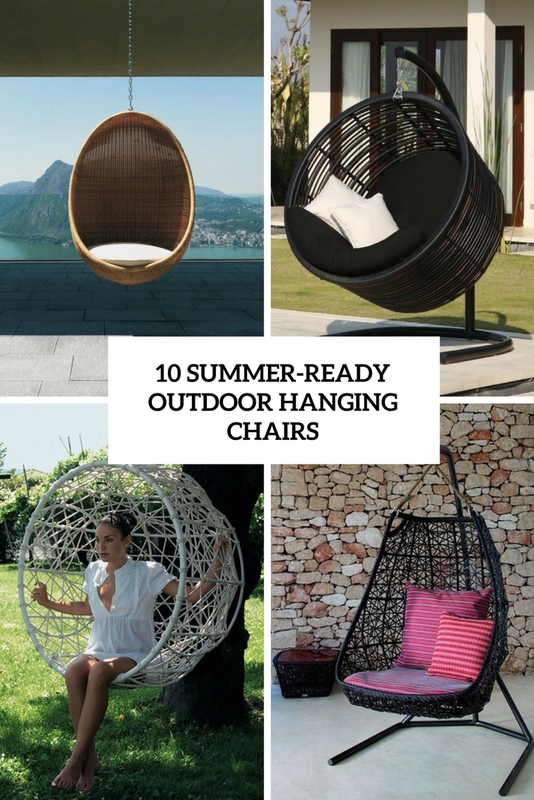 Don’t worry, we have a whole list of ready to buy hanging chairs that will make your summer very relaxing and your outdoor space stylish! Danish furniture designer Nanna Ditzel found inspiration in the shape of an egg with its pure, organic form. Her Egg hanging chair comes from a design of hers dated in 1963 and the woven chair suspends from a simple chain or a steel frame stand. The chair comes in a wicker or in Polycore in several colors. It has a shaped seat cushion in polyurethane foam and polyester fiber or in Filtren with a removable cover for comfort and easy cleaning. 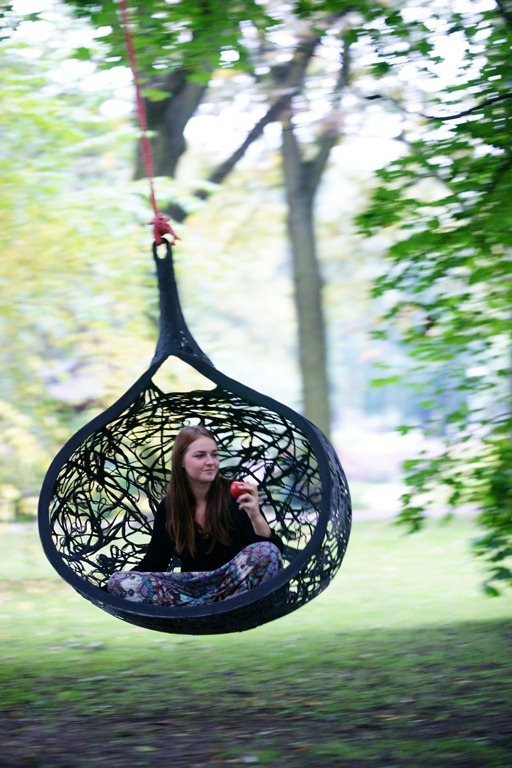 Here’s an exclusive hanging chair for gardens, patio or indoors – genuine Thinking Pod. Each chair is handmade – unique, safe and sturdy. It can withstand at least 220 kg of weight, while it weighs 15 kg. 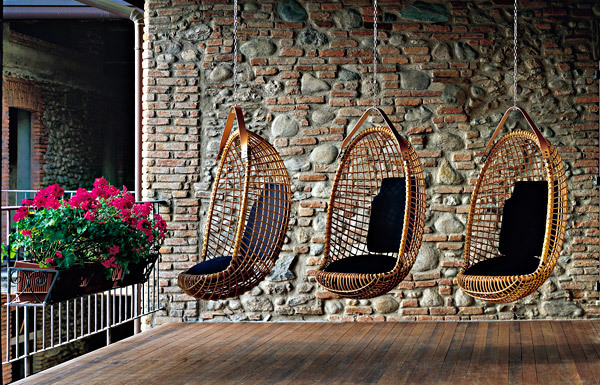 The hanging basalt fiber chair undoubtedly becomes a central interior object in the garden or indoors. Nesting could be made especially pleasant with a colorful pillow or soft blanket; black color allows to heat very quick and it’s pleasant to touch. Isn’t it enjoyable? The Gypsy Hanging Chair is hand weaved by rope, and it’s perfect for that macrame loving, bohemian, free spirited gypsy. Any boho-inspired indoor and outdoor space will look more chic and refined with this gorgeous chair – just add a faux fur cover, and voila, your amazing look is ready! 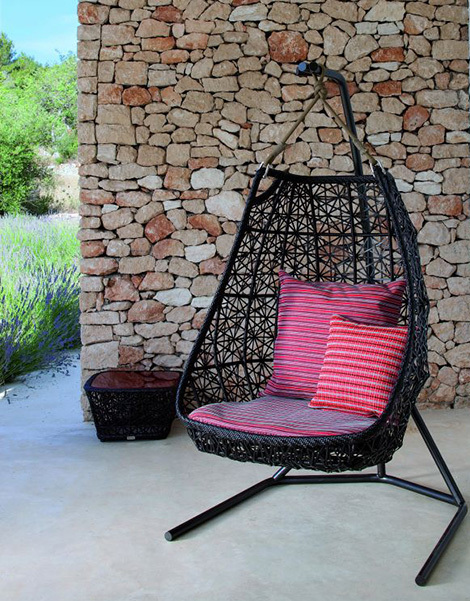 Sway in the summer breeze in style with the Skyline Fabio Hanging Chair! This is a striking style statement for the poolside or patio, it provides a welcome shaded retreat in the heat of the summer sun. The piece is made of Viro resin weave with powder coated aluminum frame and sunbrella cushions. 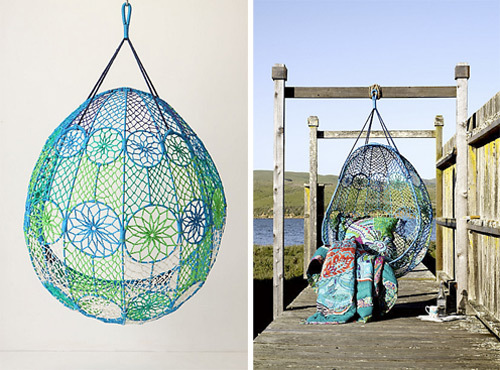 Patricia Urquiola created this super colorful and cheerful summer-inspired hanging chair called Tropicalia. Its tubular structure is covered with bold ropes in yellow, red and black, all you need is to add a couple of cushions or pillows. Such a chair will be a nice idea for a mid-century modern or boho outdoor space. Eureka hanging chair by Property Furniture is a curved rattan structured chair with upholstered polyeurethane foam cushion. There are many colors and finishes available but for outdoors the designers created a special lacquer finish that will help the piece last long. This unusual chair by Seletti istitled Emisphera. The chair is made of metal and PVC, it’s artfully hand woven and comes in white, this chair is really inviting and its spherical shape promises some cozy time in your own little nook. Seletti claims their products are for those who are looking to create a fun and personal lifestyle and Emisphera embodies this notion. 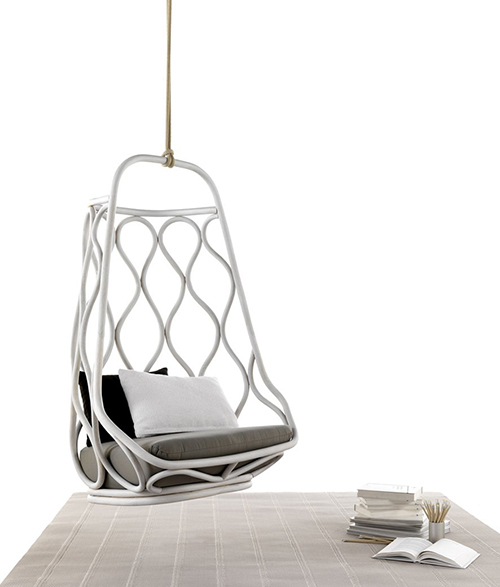 The most striking thing about Nautica, a rattan hanging chair by Expormim, is its modern interpretation of the use of rattan. This visually light, playful chair, made for lounging and casual swaying, is the perfect companion for lazy afternoons in the sun. The design of the chair casts shadows as it moves reminiscent of light reflecting waves of the sea. 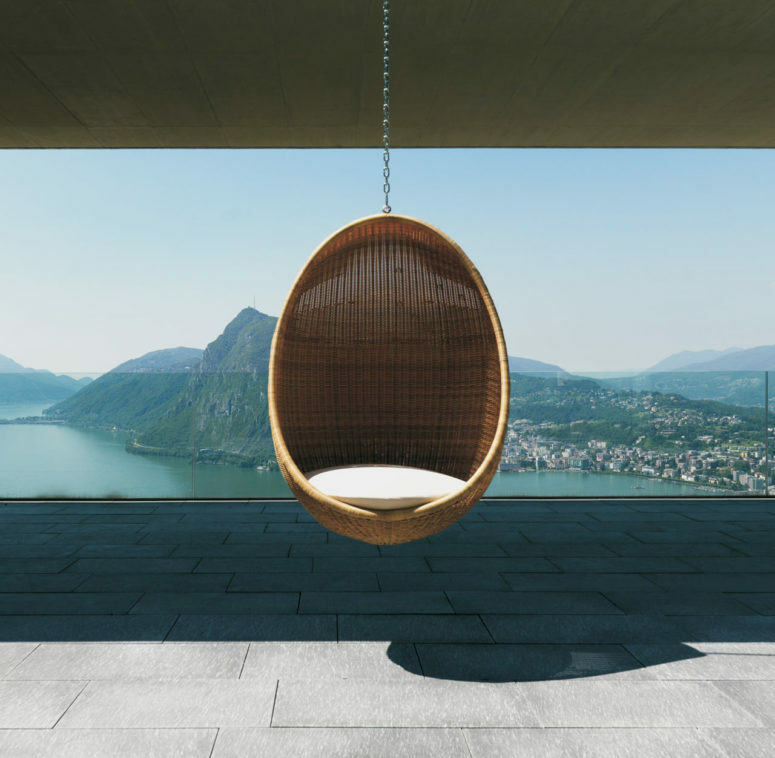 This chic hanging swing chair designed by Patricia Urquiola is from the Maia collection by Spanish company Kettal, known for a casual relaxed style of outdoor furnishings that don’t compromise on upscale elegance. 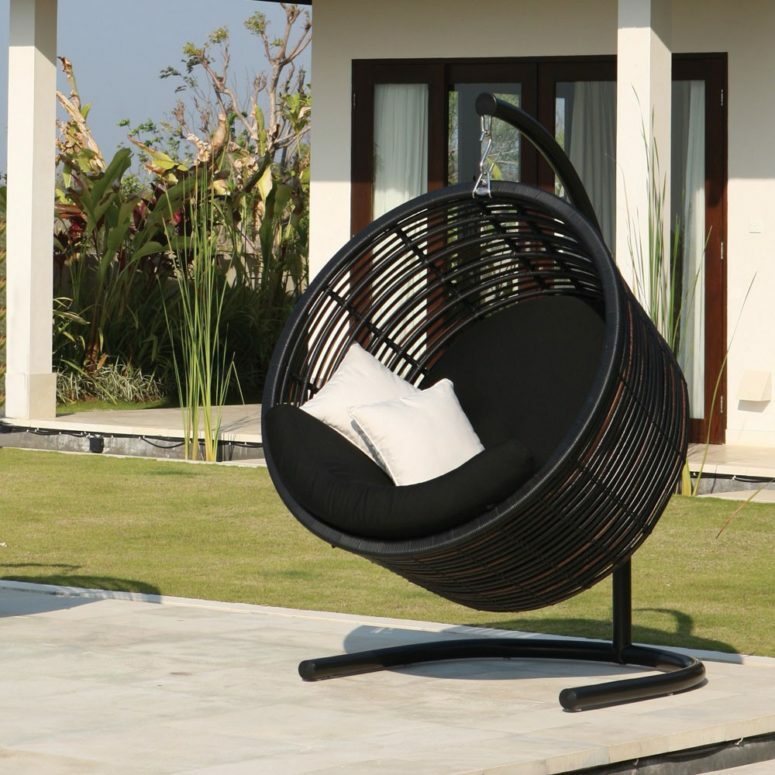 This airy rattan swing chair sails in the breeze, light to the eye and to the touch. Framed in lightweight yet durable aluminum, draped in Porotex and chenille, and braided with an artistic touch, these hanging swing chairs will quickly become the new favorite spot in the sun or shade. Knotted Hanging Chair Melati from Anthropologie is totally charming in form, you can choose the neutral motif for a calming look or from the tangerine or blue options for a more vibrant approach. Whether hanging from a beam on your porch or from a tree in your garden, this chair promises hours of fun or relaxation – playfully swinging with a refreshing cocktail in hand or a gently swaying, curled up with your favorite book, always wrapped in a stylish package.